Disney may own the world, but at least they know how to make astoundingly entertaining films. After the fantastic success of the non-musical “Zootopia” earlier this year, Disney released its second film as part of their official animation canon (the first time since 2002’s double release of Treasure Planet and Lilo & Stitch). Yes “Moana” is a fantastic animated musical in the vein of the early 90s classics. It’s just as good as “Frozen,” if not better, and features terrifically catchy songs from Hamilton’s Lin-Manuel Miranda. 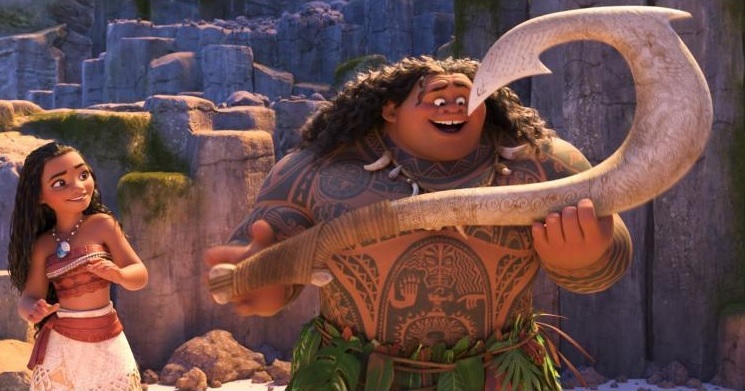 “Moana” is pretty much everything you expect and want from an animated Disney musical and more. It features terrific voice acting, strong memorable characters, ear-worm inducing songs, breath-taking animation, and a heart-tugging storyline with laughs and tears aplenty, 2D animation be damned. Moana is voiced by newcomer Auli'i Cravalho and she's one of the strongest female Disney characters in quite some time. She's got the prowess and spirit of Mulan and Pocahontas and thankfully for once there's not a love interest in sight. This is certainly not about a Disney princess who goes all googly-eyed for a handsome prince. Her father is the chief of her Polynesian village and she's set to eventually become the new leader but her island home seems to be dying as the legendary demigod Maui has essentially cursed the island after trying to steal a powerful stone that gives “life” to all the islands. She sets off to find Maui and force him to return to the stone, though he must first find his magical hook which gives him the power to change form. Maui is voiced by Dwayne Johnson and, like the Genie from “Aladdin,” instantly becomes one of the great, fun Disney animated characters. The film essentially becomes a boat-based road trip buddy comedy with lots of adventure and songs thrown in for good measure. If the film feels like it belongs with the string of successful 90s Disney movies its because it's directed by the guys who made “The Little Mermaid” and “Aladdin” John Musker and Ron Clements. They've tweaked the formula here and there but it essentially works as modern take on the classic Disney formula. There are cute critters like Heihei the moronic but hilarious chicken, a dramatic family death, and creepy villains like Tamatoa a giant treasure-hoarding crab voiced by Flight of the Concord's Jemaine Clements who even gets his own David Bowie influenced musical number. And then there's the “Fury Road”-esque sequence featuring floating barges of evil coconut pygmy pirates hell bent on stealing the stone. And there's the exciting climax involving a fascinatingly designed gigantic lava demon. After the death of Disney lyricist Howard Ashman in the early 90s it seemed like no Disney movie would be the same without the power duo of Ashman and Alan Menken but there have been lots of great songs since. “Moana” has terrific songs. At first none seem to stick out the way “Let It Go” did during “Frozen” but each one is truly special and catchy. Lin-Manual has teamed up with Polynesian musician Opetaia Foa'i for some truly great collaborations you'll be singing for days. Trailer for Moana on TrailerAddict.